Located at the edge of a switchback, on the road that heads from Banjar to Jalori Pass, the Banjara Retreat at Shoja is a pretty property, affording breathtaking views of the valley below it. At a height of 8800ft, the retreat is an ideal place to spend warm days exploring the tiny village of Shoja and the nearby Jalori Pass. About a 100 steps lead down from the main road, past a few homes, to a traditional 2-storied Kullu structure, which is the older part of the retreat. It houses the staff quarters on the ground floor, the dining area on the first floor and 6 guest rooms on the 2nd and top floor. Here the rooms have a very, rustic, traditional feel with mud walls & wooden shelves and cabinetry. Our double-room was a long, rectangular space with plenty of room for a seating area as well as a comfortable bed and vanity table with mirror. At the far end of the room was a large bathroom with modern fixtures and plumbing including hot water that’s centrally heated using LPG. To the right of the traditional structure is a modestly sized lawn from where the views to the mountains are absolutely breathtaking! Weather permitting, bonfires are held here in the evenings by Mr. Rishi, the retreat’s friendly host. 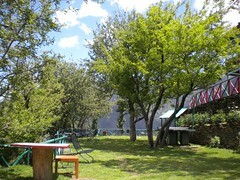 It’s also a great place to relax during the day, under the shade of a tree, with a book! a couple of Executive ones. On the day of arrival, since the standard rooms weren’t available, we stayed in one of the Executive ones and enjoyed it thoroughly. In spite of the traditional flooring and cabinetry, this room has a distinct contemporary feel and is quite tastefully furnished. A long gallery at the back of the room (common to the adjoining Executive room) has large, glass windows overlooking the beautiful valley and mountains. With sofa seating and chairs, it is a great place to lounge in; definitely our favorite part of the retreat! 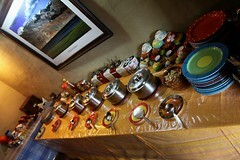 Meals are included in the cost of stay and they are quite sumptuous. Lunch is usually vegetarian fare while dinners include a non-vegetarian dish and dessert! The dining room floor has small rooms with large, rectangular tables that can accommodate 8 to 10 diners; perfect for families or large groups. Smaller tables are placed in the gallery outside these rooms by the windows and this is where Madhu and I ate most of our meals. The staff at the retreat was both courteous and quite warm. Mr. Rishi, in particular, was a pleasant person to chat with. He had good knowledge of the region and was able to guide us on things to do in and around Shoja. At first, we were a little surprised to find the resort wedged in between village homes without any wall or boundary separating them. But later we realized that this added to the feel of living right in the middle of a village, with villagers passing by going about their daily routine of taking the cattle out to graze or bringing back baskets full of hill garlic; it was all quite interesting to watch . 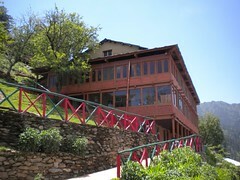 Overall, Banjara Retreat at Shoja is a great place to unwind and relax, enjoying the wonderful scenery surrounding it.